2. At our house, applesauce and football are the harbingers of fall. What are they at your house? Again anything Pumpkin, the return of my fave tv shows, college football; Nebraska football as a matter of fact. GO BIG RED!!! 3. Someone gave me an “automatic” apple peeler from one of those home cooking product shows. (It doesn’t work all that great.) What’s one kitchen contraption or tool you’d gladly trade me for it? Hmmm…I cant think of anything. 5. Cider, apple juice, or hard cider? Discuss. Actually all of these! Hot Cider on a cold day is fantastic. And I love hard cider. Its usually my drink of choice. To make the streusel topping, combine flour, sugar and cinnamon in a small bowl. Add cold butter and toss to coat, using your fingers to work the butter into the dry ingredients until it resembles coarse crumbs. In a large bowl, combine flour, sugar, cinnamon, ginger, nutmeg, baking powder, baking soda and salt. In a large glass measuring cup or another bowl, whisk together pumpkin puree, butter, eggs and vanilla. Place into oven and bake for 16-18 minutes, or until a tester inserted in the center comes out clean. To make the glaze, combine confectioners’ sugar, butter and milk. Whisk until smooth. If the glaze is too thin, add more confectioners’ sugar as needed. Only afterwards, do we realize that we have “found” something that we like–like a new way to look at something; a new (to me) author; a new song or hymn; a new food. Today share with us something that you like that seemed surprisingly “new” to you sometime in the near past. It could even be a RE-discovery. Here is a list, but you can choose your own five items you would like to share! Please join us today in playing FF. 1. Author–Hmmm! I love reading. But one of my new favorites is definetely Richard Paul Evans. I recently finished the Walk series and it was so awesome. I love how down-to-earth his characters and stories are. 2. Shampoo– Sebestian Drench. My hairstylist told me about it and it is definetely on the spendier side. I love how well it works on my hair! 3. Food–Thai Food. 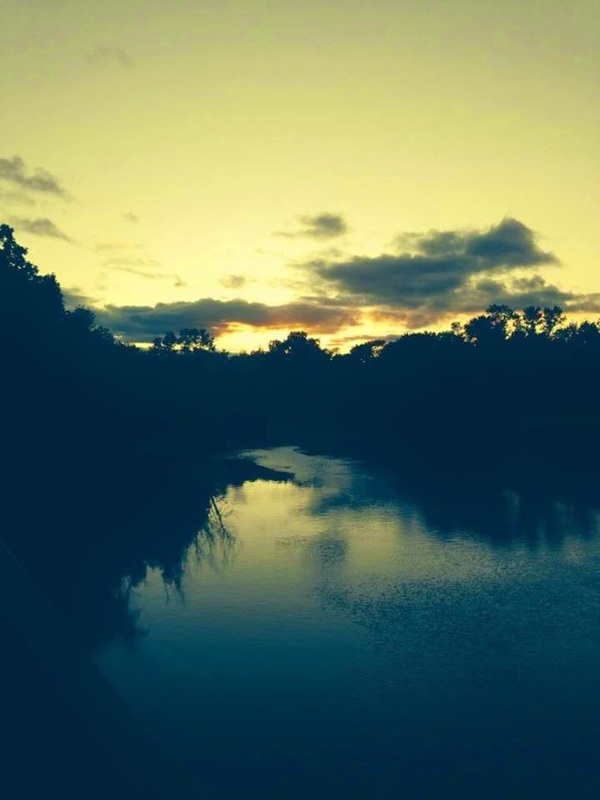 I didn’t think I would like it but when I lived in F-M, I found out I really LOVED it. I have been missing Thai food. I recently tried a recent here and liked it. But there is another Thai restaurant here in town I havent tried yet but I have heard great things about it! Cant wait to try it! 4. Activity–Zumba! I love Zumba. But the Curves I attend didnt offer it in the summer months so we are getting going again. I havent been able to go yet but am already looking forward to next week. 5. Music–Old school Jars of Clay! Jars is my fave and I love going back and listening to their early stuff like Love Song for a Savior. 1. If you could sneak away anywhere this weekend, right now, all expenses paid, where would you go and what would you go ? I would go visit my friends that I miss. Or maybe I’d go to my beloved castle; the seminary I attended. I also would love to go spend some time in the Rocky Mountains. Or maybe I’d go to Ireland; a place I dream of visiting some day! 2. What is for lunch today? (one of the very first FF I ever played asked this.) I skipped lunch but snacked on some Totinos pizza rolls. 3. Along that first-FF-I-ever-played theme, what are you wearing today? I’m wearing cute jeans from the Dress Barn, my fave well worn casual Sketcher tennis shoes, a Newsboys tshirt with bright neon colors that says “Your love never fails” and my fave Lutheran Chick sweatshirt. I’m also sporting a newsboys style hat that is blinged out with a cross. It’s gotten chilly here this week in ND. 4. Along the Today Theme, what are you doing today? Just enjoying my day off. 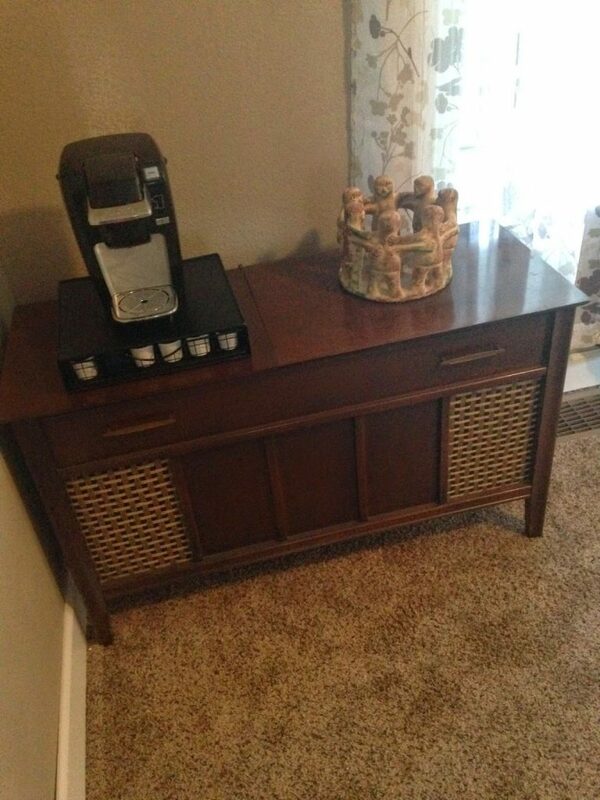 Picked out a few recipes from Pinterest and got some shopping done. Now Potato soup cooking in my crockpot. Catching up on my DVR! 5. Along the random theme, what is your favorite scent, and why? I love cinnamon!! Cinnamon candles, cinnamon candy etc. I love Bath and Body Works Juicy pear scent. I really love any scent that makes me smile. Pumpkin, apple cider etc in the fall, peppermint at Christmas time etc. Oh the Places We Can Go Friday Five! Here I am in Western North Dakota! Yes, we have been impacted by the oil boom but ND has and will always hold a special place in my heart. 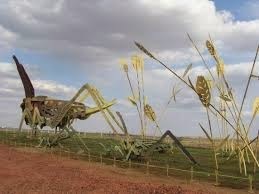 In fact, the name of my blog comes from the prairies of North Dakota. Something so holy about being on the prairies of ND! North Dakota has the most gorgeous scenery when the fields are been harvested. I am a little biased but the skies of North Dakota are GORGEOUS! The sky as far and as wide as you can see. With all that in mind, I would take you to the Badlands, Theodore Roosevelt National Park and Medora, ND. 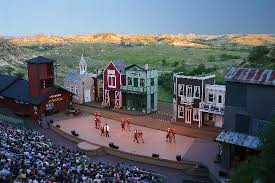 The Medora Musical is a gem and is held every summer. ND girl Kat Perkins (who became wellknown on the tv show The Voice) even has made a few appearances this summer. Medora is a quant little tourist town and is so fun. Teddy Roosevelt used to hang out in this area a lot. He loved it there! And if we’re lucky, the buffalo will be out in the park. I’ve been in the park and had to stop because the buffalo were blocking the road. Leaving Medora, we would find our way to the Enchanted Highway. The Enchanted Highway is a highway with the worlds largest scrap metal sculptures constructed at invervals along the way. It really may seem odd but it is fun to see a master artist. North Dakota has had some great travelers who have crossed her path. Sakakawea and Lewis and Clark were some of those travelers. 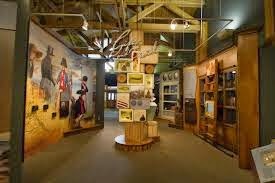 The Lewis and Clark Interpretive Center is a great spot to stop especially if you are history buff. You also can see points along the Missouri River where they more than likely camped out on their journey. Imagine the cold etc they experienced as they were traveling. In all honesty, people don’t give North Dakota credit. There is something so holy about this place. And there is truly things to do here. You can take in a Fargo-Moorhead RedHawks game in the summer. You can go to one of the states zoos. For the size of ND, there really are great zoos…Fargo, Wahpeton, Minot, and Bismarck. What’s In A Name Friday Five! 5. If you were to write under a pseudonym, what might that be, and is there a story behind that name? I think it would have something to do with the Prairie like my blog title. Growing up on the Prairies of ND they hold a special place in my heart and are very holy for me. Hmmm….I’ll have to think about this one for awhile longer! 1. Are you superstitious about anything? Like, lucky socks for competition, special necklace for preaching, etc.? Nope I am not really superstitious about anything. I always think of when I was a little girl and we used to not step on the sidewalk cracks cuz it would break your mothers back. I do knock on wood when I dont want certain things to happen. 2. I’m going on vacation on Tuesday. I have never been so ready for vacation. What are you looking forward to? The Lutheran Academy of the Rockies!!! This will be my fourth summer attending this continuing education event that is held in the heart of Rocky Mountain National Park. I will leave next Sunday June 22nd after worship and will drive half way. The even starts Monday the 23rd and goes through July 3rd. But I am staying through July 4th. 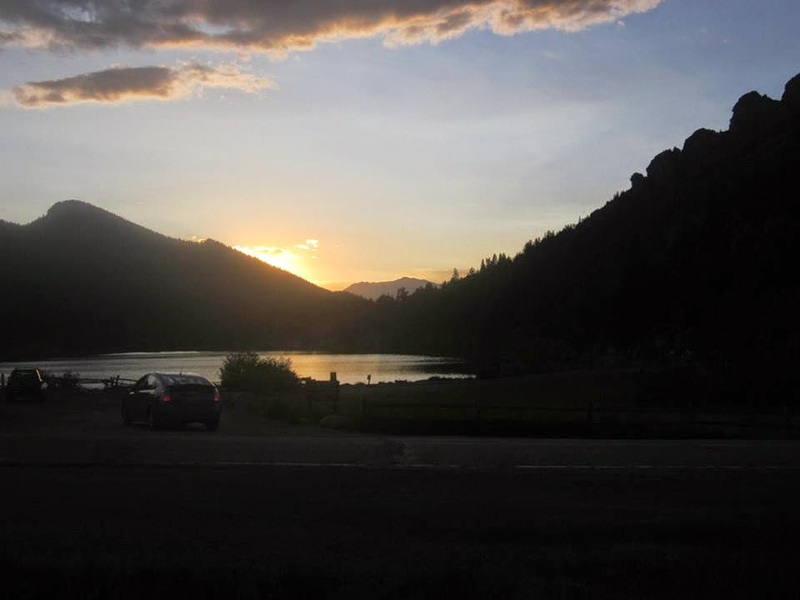 Just think it will be fun to spend the 4th in Estes Park. 3. There is a lot going on in sports right now–World Cup, Basketball finals, and much more. If your life were a sport, what would it be, and why? I guess volleyball. I think of the sets and the spikes. I think of the inbounds and outbounds. 4. Hey! Remember orange push-up ice cream treats? What happened to them? What is one of your favorite summer treats? Ice cream sandwich, popsicles, frozen grapes, fruit pizza, DQ Dilly Bar, etc.? I think you can still order push-ups from Schwans. Pretty sure I saw them in their catalog the other day. I love ice cream in the summer. I love the mint dilly bars. I love the new trend of frozen yogurt places. I also love watermelon. I also love fresh grown tomatoes!